Nests of Clarke's Weaver found! Clarke's Weaver has a restricted in the Arabuko-Sokoke Forest and the Dakatcha woodlands in SE Kenya. This species is most often seen foraging in flocks in the Arabuko-Sokoke Forest, especially in Brachystegia woodland, but its nest is not known. In January 2013 a team of Kenyans found possible evidence that this species breeds in reeds (see here), and now they have confirmed this. Dakatcha Woodland Conservation Group and Nature Kenya are happy to report that Clarke's Weavers are breeding in Dakatcha Woodland Important Bird Area in March 2013. The breeding grounds of this endemic and endangered bird have been a mystery for many years. David Ngala and Don Turner saw adults feeding flying young in Dakatcha Woodland in 1994, but the actual nesting site had never been found. Nature Kenya has had a project to monitor the weavers and raise community awareness in Dakatcha Woodland IBA since 2005, and I have visited Dakatcha Woodland with the local team regularly since 2007. When Martin Odino found Weyns' Weaver in Kenya, we learned that this Ugandan bird foraged in forest but nested in swamps. Since then we have searched the wetlands of Dakatcha Woodland as well as the Brachystegia woodland. On 6 January the team found a flock of Clarke's Weavers in a seasonal wetland of grass and sedge, but we could not see them either building or feeding. Smaller monitoring teams found the weavers in the same wetland in late January to early February and again in early March. Not wanting to disturb the birds, we did not venture into the wetland. Then on 22 March a team composed of Jonathan Mwachongo, Patrick Changawa, Julius Mwambire, Japhet Garama, Kazungu Thuva, Samuel Kenga, Samson Katisho, Peter Wario and myself, Fleur Ng'weno, visited the area again. There had been some showers of rain, and all the Brachystegia trees were vibrantly green and in flower. At the wetland, however, our hearts sank; the sedges had been cut for thatch. We collected a few empty nests on the ground to take to the National Museums of Kenya. On the way back to the campsite, we passed a seasonal wetland where we had stopped several times in other years. Should we check it again? Of course! And we found a large flock of Clarke's Weavers in the sedges. 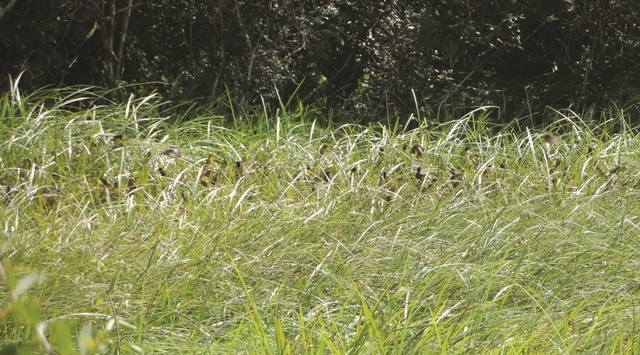 We observed the Clarke's Weavers carefully from the shade of trees bordering the wetland. There were several hundred, males and females, actively flying back and forth across the wetland. Some males seemed to be displaying, others just perching on the sedges. They were making their buzzing, sizzling calls. Then we saw the brownish, rounded shapes of nests. A few males flew in, carrying strips of building materials. One male was seen weaving more sedge strips onto a nest. This was it! The breeding site. The next morning we arrived at 6:10 am and found the Clarke's Weavers already active, flying back and forth within the wetland and singing. Frogs and toads were also calling. Then flocks of 60 to 100 birds began to lift up from the wetland and fly up and away. We presumed they went to feed in the forest. Seven flocks flew off in the next half hour, giving us an estimate of about 550 birds. Many weavers could still be seen in the wetland. We estimated the group to be about 700 birds - perhaps as many as one thousand. We took photos and a video. A few men, women and children from nearby homesteads came to the wetland to collect water. They were at the far end of the wetland from the weaver site and did not seem to disturb the birds. On 26 March, we were joined by Mike Davidson, George Odera and Brian Finch from Nature Kenya and Colin Jackson and Silas from A Rocha. They brought telescopes for better viewing and took photos. The weavers were still active, but less busy building; many of them sitting on top of the nests. Brian Finch estimated some five hundred nests concentrated in the small area of sedges within the grassland. The breeding of Clarke's Weavers in Dakatcha Woodland is thus confirmed. Dakatcha Woodland Conservation Group, with support from Nature Kenya, is taking active steps to protect this first known breeding site. Representatives will visit the area later this week to talk to the local elders. They will also inform the representatives of the government in the area. We hope that once the people living near the wetland realize the importance of these birds - found only in Kilifi County and nowhere else in the world - they will take steps to see the wetland is not disturbed. This finding will be published in greater detail, and with photos, later. Some other weaver species that breed in reeds but forage in woodland or forest during the non-breeding season are the Thick-billed Weaver Amblyospiza albifrons and Weyns's Weaver Ploceus weynsi. PS: see the PHOWN record here. Read more at NatureKenya report 1 and NatureKenya report 2.